Referrals help you build credibility and relationships with potential clients. Here are 10 quick ideas to help you get client referrals. 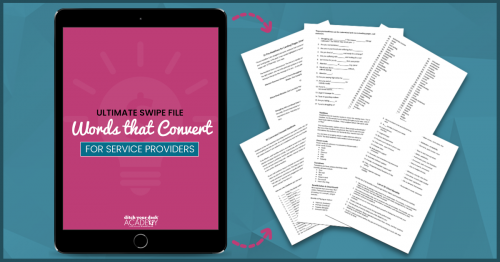 Get the full list of 30 in my Ultimate Swipe File of Words that Convert for Service Providers. 1. Ask your current clients for referrals. Give them an idea of what services the new client should need, such as tech or writing. 2. Write a referral email for clients to send to their friends, who are in need of a particular service you offer. 3. Work with other providers to exchange referrals for services the other provider doesn’t offer or want to do for clients. 4. Let your current clients know about the services you offer. List the benefits of each service to make it easier for current clients to spread the word. 5. Put a link in your emails or other correspondence to a form on your website for referral submissions. 6. Offer your client a referral commission or discounted service. When a new referral hires you, you can repay the efforts of the client who referred the person. 7. Leave extra business cards with clients. Ask them to pass them on to others, who might need your services. 8. Create a Facebook post about your services. Share with clients and urge them to share on their page or tag friends. 9. Write a blog post about your services on LinkedIn and share it with your clients. Ask them to share it. 10. Once a client has sent you a referral, send them a thank you note or phone call.